Michael Floyd makes a juggling catch for a touchdown to put the Cardinals ahead late in the fourth quarter of Sunday's 17-10 win over the Seahawks. SEATTLE (AP) — Carson Palmer felt confident in where he needed to go with the throw. He also knew he was throwing to a wide receiver who hadn’t made a reception in the previous 57 minutes. A perfectly placed throw by Palmer and a juggling catch by Michael Floyd kept the Cardinals in the playoff hunt for another week with a surprising 17-10 win over the Seahawks on Sunday. Palmer overcame four interceptions to find Floyd on a 31-yard touchdown with 2:13 left, and Arizona won for the seventh time in eight games while snaping Seattle’s 14-game home win streak. "It’s tough not to get the ball thrown your way until the last play of the game, essentially," Palmer said. The Cardinals were nasty on defense, frustrating Russell Wilson into the first home loss of his professional career and giving Palmer a chance to come through late. Palmer did, and now Week 17 has meaning for Arizona. "An ugly win is a win regardless of how it comes out," Palmer said. "There was a handful of times where the ball really bounced their way today, and we were resilient, kept fighting, kept believing and came out and got a win." Palmer was mistake-prone early, throwing three of his four interceptions in the first half. He was twice intercepted in the end zone, including Richard Sherman’s second pick of the game early in the fourth quarter. His winning drive made up for the earlier errors. Palmer led Arizona 75 yards in 10 plays. Floyd had been targeted four times previously without a reception, but on the go-ahead score, he beat Byron Maxwell down the sideline and Palmer’s throw was on the mark. 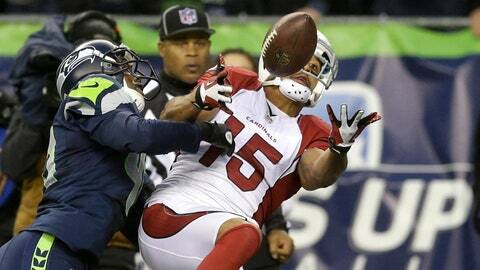 The 58-0 beating the Seahawks put on the Cardinals last season in Seattle is history. The memory now is Arizona handing Seattle its first home loss since Dec. 24, 2011, against San Francisco. "Any time you come on the road and the team beats you 58-0 and you have to come back to their place, it lingers to the back of your head," defensive tackle Darnell Dockett said. "If you got any pride in any game of football, when a team beats you by 58, you know you think about it and it’s stuck on you." Palmer finished 13 of 25 for 178 yards. Floyd’s TD reception was his only catch, and Larry Fitzgerald was held to three catches for 18 yards. Arizona didn’t need to be explosive offensively because of its defense. Wilson was 11 of 27 for 108 yards, taking his first home loss since he was at North Carolina State. Seattle went three-and-out seven times. They had only 22:36 of possession. Wilson rarely had time to throw, and when he did, he missed open receivers. His final pass was underthrown, deflecting off Doug Baldwin’s arm, into the air and then into the arms of Karlos Dansby with 1:56 left. The final pass was another moment of debate for the Seahawks, who earlier thought they had recovered a fumble only to have replay side with the Cardinals. The pass appeared to hit the ground before deflecting off Baldwin and to Dansby. It was ruled an interception on the field, though, and referee Scott Green told a pool reporter there was not indisputable evidence to overturn that call. Baldwin was emphatic the ball hit the turf. "I would have loved to get that call," Baldwin said. "I believe the ball hit the ground. But that’s not why we didn’t win the game." Until the winning scoring drive, Palmer’s day was defined by poor decisions and unlucky bounces. He was intercepted in the end zone by Kam Chancellor on Arizona’s opening drive when his pass deflected off the hands of Rob Housler. He was picked off by Malcolm Smith in Seattle territory in the second quarter on a tipped pass, and he twice threw interceptions to Sherman, the second a poor decision. But Palmer was fantastic on Arizona’s decisive drive after Seattle took a 10-9 lead on Wilson’s 11-yard TD pass to Zach Miller. Palmer started with a third-down completion as he was about to get crushed by Clinton McDonald, lofting a pass to Jake Ballard for 17 yards. The drive was kept going when Smith was flagged for defensive holding on a third-down incompletion. On third-and-6, Palmer dropped a perfect throw beyond Maxwell and into Floyd’s hands. Floyd juggled it at first but then controlled the ball as he hit the turf. Rashard Mendenhall scored easily on the 2-point conversion with 2:13 left. "Whether we make the playoffs or not, we beat one of the best," Cardinals coach Bruce Arians said. NOTES: Arizona won in Seattle for the first time since 2009. … According to STATS, Inc., it was the third regular-season game Palmer threw four INTs but the first that he won. … Seattle K Steven Hauschka missed a 24-yard FG in the second quarter off the left upright. It snapped a streak of 22 straight makes.